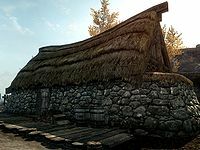 Fellstar Farm is a farm in Ivarstead, located across the road from the lumber mill and south of the bridge to High Hrothgar. It is the home of Jofthor, Boti, and their daughter Fastred. It consists of one zone, Fellstar Farm. Upon entering, you'll find that this small home is laid out with the bedroom area to the right and the kitchen and dining area to the left. To the left of the door, there are three garlic braids, and one portion each of dried elves ear and dried frost mirriam hanging along the north wall. A respawning food barrel sits in the northeast corner, next to a non-respawning cupboard holding various dishes on its shelves. Another respawning food barrel is in the southeast corner, next to a dining table on the south wall. The table holds a pine thrush egg, one bottle each of alto wine and Nord mead, and a bucket containing three potatoes. This table also holds Wylandriah's satchel, which contains Wylandriah's spoon for the related quest. Beneath the table, a chicken's egg and another pine thrush egg lie on the floor. Above the table are some more hanging ingredients, including another portion of dried frost mirriam, two portions of dried elves ear, and three garlic braids. Next to these are two hanging racks, one of which holds three freshly caught rabbits while the other holds three pheasants. On the right side of the table, a respawning meat barrel sits next to a set of shelves holding books, alcohol, and dishes. This includes four bottles each of wine and alto wine, and a copy of the books A Dream of Sovngarde, A Minor Maze, The Cabin in the Woods, and Rising Threat, Vol. IV. To the right of these shelves is the fireplace, with a cooking pot at the center and a kettle holding two leeks on the right. The west side of the house is where you can find the three beds belonging to the residing family. The southwest corner holds Jofthor's bed, with a non-respawning chest at the foot of the bed. Next to this bed is a non-respawning end table holding one bottle of Nord mead. Along the north wall, Boti's bed is in the corner and Fastred's bed is closest to the door. Between these beds and the front door is a small table holding one loaf and one piece of bread, as well as a bottle of alto wine. The front door has an apprentice lock, the key to which is carried by Boti, Fastred, and Jofthor. The front door is unlocked from about 11:50am to 12:30pm by Fastred and again from about 4:50pm to 11pm by Boti. A grain mill can be found here, which can be used to produce flourHF from wheat if Hearthfire is installed. Two respawning food barrels sit outside the house, to the right side of the wood pile. A goat cheese wedge can be found in front of the chickens' nests. This page was last modified on 15 September 2016, at 02:20.